As part of my New Year's Resolutions I made a Pinterest Resolution to actually make my pins. Crazy, huh? This one was a twofer from my to do board. Two pins combined into one! I should get double brownie points on my Pinterest Resolution. Haha! As soon as I saw the finger knit garland, I ran into the guest room and pulled out some yarn I had in the closet. In no time I had this cute garland! My goal was to make a finger knit garland for the Christmas tree. I even picked up some white yarn to work with. I was a tad late so I have stashed the yarn with the Christmas stuff for next year. This garland sat in the yarn bag for a couple weeks, but then I needed a White Elephant gift for a New Years get together. I thought it would be a cute, inexpensive (free? since I already had it on hand) gift. I wanted to add a little flair, so I found a pom pom pin that I had seen all over Pinterest. I made a pom pom for each side of the garland. They are extra cute and super easy to make! Finger Knit Garland - Alison has a wonderful video tutorial on how to make these finger knit garlands. I love how she draped them around her Christmas tree. I want! 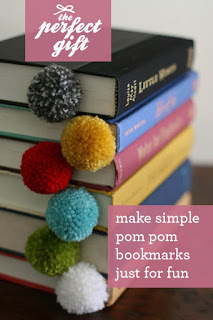 Pom Pom Bookmarks - This Pom Pom tutorial by Design Mom is a really great tutorial with crystal clear pictures. I'm quite jealous of the quality of her pictures. I love her finger knit garlands. Mine turned out a little looser than hers. I think she used a larger gauge yarn, but mine still came out cute. I'm going to keep this in mind the next time I pick out yarn for a finger knit garland. When making the pom poms, I used 70 wraps instead of 90. You will want to count your wraps when making them so you are consistent. 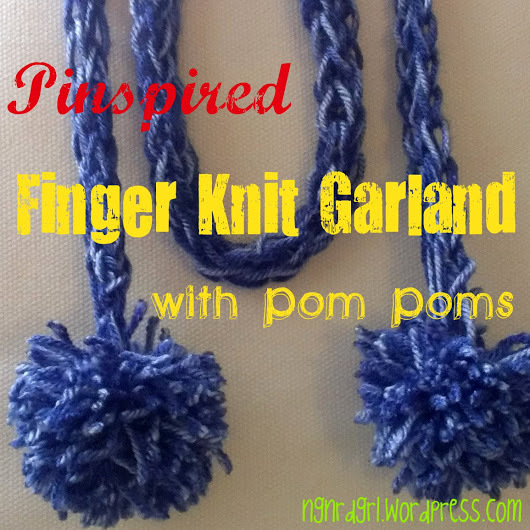 What do you think of my Finger Knit Garland with Pom Poms? I almost couldn't bear the thought of giving it away. It was too cute! The person who opened it immediately put it on and wore it the whole night, so I consider it a success. I am planning on making a longer one to drape over the window in the guest room. This yarn was picked out to match my updated guest room decor. You should! This is a perfect craft for children. It is really simple and fun. How fun! 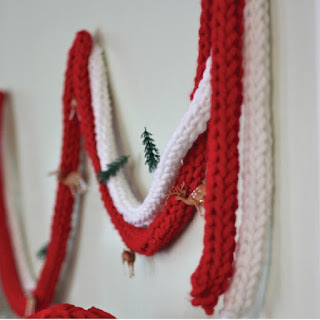 I had never thought about using finger knitting as a tree garland. I'll have to remember this for next Christmas! Oh, I'm so doing this for Christmas! The tutorial has some pictures of her garland on her tree, and it looks so nice! I'm planning on doing a whole bunch of yarn ornaments too. On my to do list for Christmas next year! So cute Bethany! 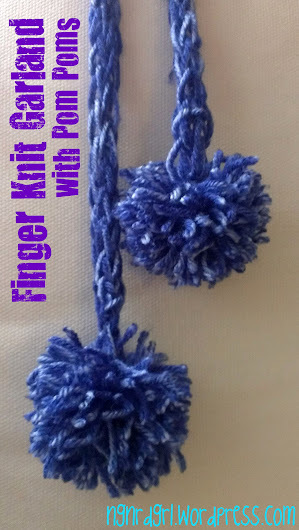 My girls finger knit - and they loved making my pom pom flowers - maybe they can put the two together like you did! This is a great project for children! 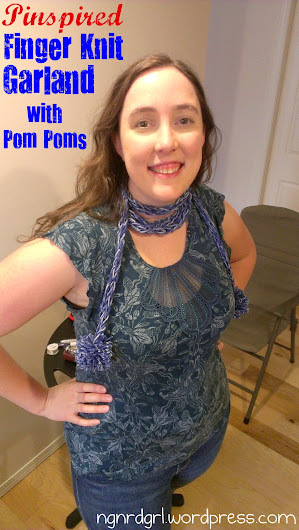 I LOVE pom poms! They are just so cute! I'm totally thinking about making your pom pom flowers. What I love about this is there are just so many options with yarn. It can suit any one's color pallet. Great projects. My daughter loves pom poms! This is amazing! I had no idea you could even do such a thing. I'd love it if you'd link this up to The Pinspiration Project! How did I miss this post? So glad you linked up to it in your paper flowers post. I plan to make pom poms for the first time with an upcoming garland project I have...will have to refer to these tutes you link to. And your scarf turned out loverly. What a lovely smile you have! Awwww! Thank you! You should make some!!! They are so much fun! I want to make more. I'll have to come up with another project for them. Yay! So happy to see your comment and sweet link up on my blog today; miss you, friend! And congrats again on your recent nuptials. A new exciting chapter of life has begun. Also...I heart this garland / scarf. You wear it oh so well, Bethany. HUGS! Thanks, Lauren! 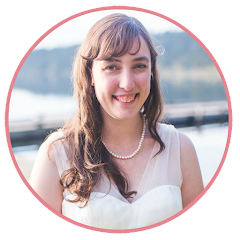 It's an old one, but I am starting to get the blogging itch again. I've got a couple posts scheduled and have a few drafts in the works. Yay! HUGS back!